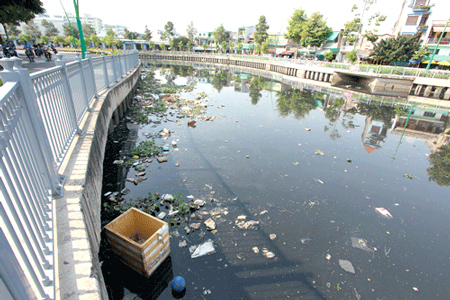 VietNamNet Bridge – Officials have admitted that water pollution in Vietnam has gotten out of its control, creating serious repercussions for both individuals and communities. Nicotex Thanh Thai Company in Thanh Hoa Province can be cited as a typical example of the serious impact of polluted water on humans’ lives. It was recently revealed that the company has been illegally burying hundreds of tons of chemicals underground for the last several years. About 1,000 people residing nearby, especially those living close to Roc Niu-Bai Tho have been diagnosed with various diseases, such as cancer, neurological disorders, infertility and birth defects. Many of the diseases are fatal. At the time when the water source in one hamlet of the Thanh Chuong District of Nghe An Province was discovered to be contaminated with arsenic, tens of people in the locality had already been stricken with various cancers. Nguyen Ngoc Ly, Director of the Environment and Community Research Center, said 40-50 percent of female patients with vaginal diseases had been found to have been using polluted water. It is estimated that 9,000 Vietnamese die every year because of unsafe water and unhygienic conditions. And, according to Ly, 200,000 new cancer cases every year are believed to have originated from the use of polluted water. Meanwhile, a report of the MONRE’s Water Resource Programming and Survey Center disclosed that there are 37 cancer “hotspots” all over the country, created by the war’s toxic substances, industrial waste or polluted running water. According Tran Viet Hung, Deputy Director General of the Environment Directorate, an arm of the Ministry of Natural Resources and the Environment (MONRE), Vietnam has a profusion water resources, with more than 2,300 river and streams longer than 10 kilometers, and thousands of lakes and ponds. However, the misuse of natural resources has seriously damaged many of these water sources. In big cities, water sources have been polluted by industrial factories and workshops which don’t have waste treatment systems. In rural areas, untreated and improperly disposed waste has been absorbed into the earth, contaminating underground aquifers. Dr Pham Van Loi from the Environment General Directorate has suggested building up a law on protecting water resources, though Vietnam already has the 2005 Environment Protection Law and the 2012 amended Water Resources Law. Loi said that the 2012 water resources law does not contain detailed provisions on controlling water pollution. Agreeing with Loi, Ly said that it would be better to have a more specific law on protecting water resources due to the complicated matters in the field. However, an analyst said more laws and legal documents would not help settle the problem, if people don’t have the awareness of the importance of water resource protection, and if polluters are not severely punished for their violations. He said people now don’t think laws can protect the environment and they would rather apply the “law of the jungle” to deal with polluters than wait for more laws to come out.